BENTONVILLE, Ark., USA — As Crystal Bridges Museum of American Art readies to host the Picturing the Americas International Symposium this weekend, in conjunction with the ongoing exhibition Picturing the Americas: Landscape Painting from Tierra del Fuego to the Arctic, a newly-reconstructed Frank Lloyd Wright Usonian-style gem awaits public visitation. Now showcasing on its grounds the only Frank Lloyd Wright house in Arkansas, the museum is also the only U.S. venue to host Picturing the Americas, the first exhibition to explore the evolution of landscape painting from the early 19th century to the early 20th century in an inclusive, hemispheric context. Continuing through January 18, 2016, the international exhibition arrived from the Art Gallery of Ontario and will next travel to Pinacoteca do Estado de Sao Paulo. 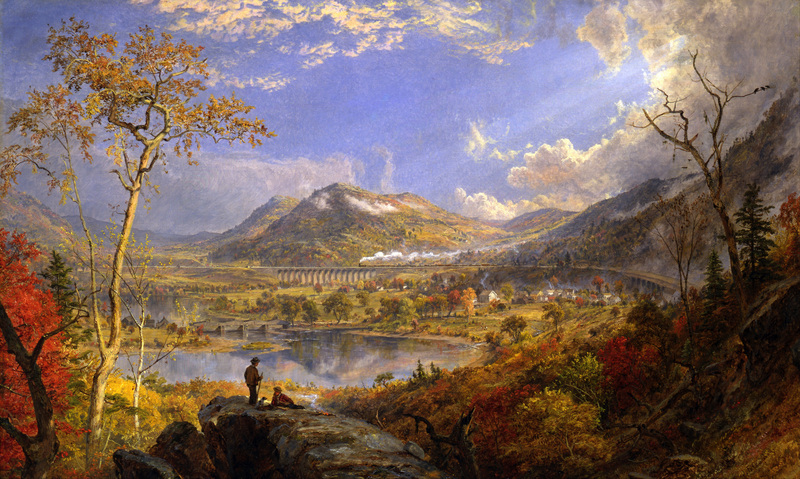 “The exhibition…helps us reflect on ways nature has shaped our identities…and consider what it means to be ‘American,’ in the most expansive sense of the word,” says Crystal Bridges curator Mindy Beshaw. So too does the architecture of Frank Lloyd Wright give pause for reflection related to the continuing influence of nature upon our identities and designs for living. As some ten Wright masterpieces of architectural design — such as the Price Tower (his only ‘skyscraper’) in Bartlesville, Oklahoma, and his famed Fallingwater National Historic Landmark in southwest Pennsylvania — are currently being considered for UNESCO World Heritage Site designation worthy of ongoing stewardship and preservation, we are reminded that Wright was quite often inspired by flowing water, seed pods or tree branches (landscape elements) as his iconic ideas evolved. Wright referred to his Price Tower as “the tree that escaped the crowded forest,” having taken his inspiration for its cantilevered design from a tree. And the clerestory windows designs used in the Bachman-Wilson house feature geometric patterns through which shadows and daylight project on the living space, with perforations inspired by the seed-pod of the Sycamore tree. 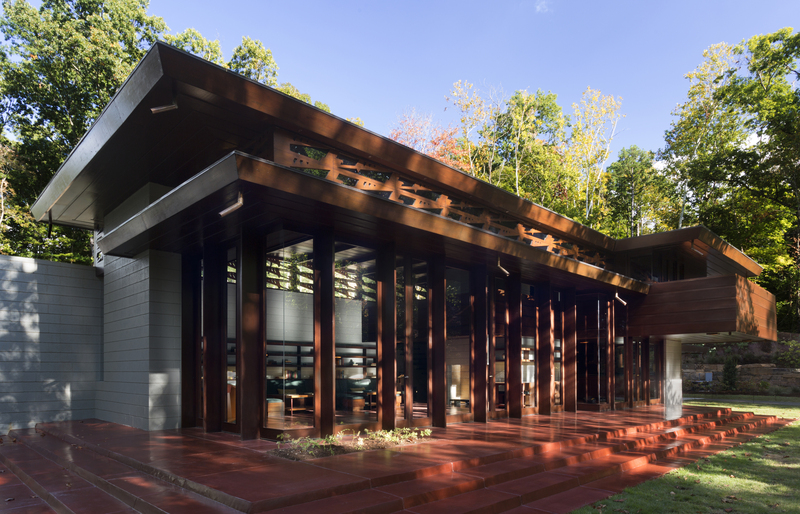 Situated on a highly-elevated two-acre site in a wooded setting above the Crystal Spring and pond for which the museum is named, Frank Lloyd Wright’s Bachman-Wilson House officially opened for public viewing yesterday, November 11 at 11 a.m. at Crystal Bridges museum. Following a lengthy journey from New Jersey, and meticulous reconstruction, the house will now be open to museum visitors in accordance with regular museum hours, though reservations and tickets will be required, at no cost, for small groups to enter and explore the intimate interior on their own, or on a guided tour. The green expansive lawn and surrounding grounds, featuring 20 species of trees, shrubs and perennials, hearken to suburban intent and the simplicity of the 1950’s. “We put great effort into upholding (Wright’s) design principles — he believed in connecting physically and spiritually to the natural world through the use of horizontal lines that ground the structure into the landscape and dissolve the barrier between the interior and exterior,” says Crystal Bridges chief engagement officer Niki Stewart. Flooring features include a 4 x 4 grid system that aligns from the floors up the walls to the ceiling, the Cherokee Red concrete, as Wright referred to it, providing Wright’s signature aesthetic, while radiant heat floors show his innovative building techniques. Wright was a pioneer of radiant heating in the U.S. — a system of flooring pipes used to carry hot water for consistent, efficient and comfortable warmth. All built-in furniture is original to the house, and most of it, such as the Origami chairs and living room table lamp (designed by Wright for his famed Taliesin), was designed by Wright himself. 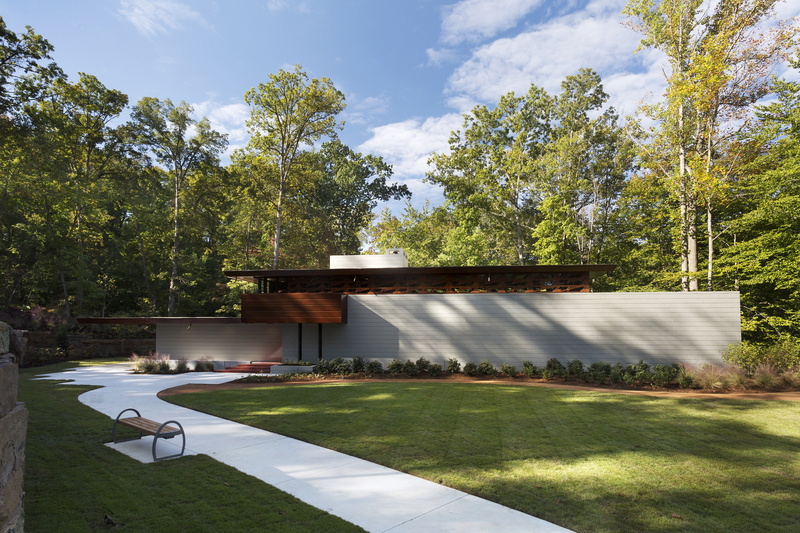 Now located near the museum’s south entrance, the newly-reconstructed Usonian house was designed in 1954 for Gloria and Abraham Wilson and was originally built along the Millstone River in New Jersey, a situation which subjected the home to repeated flooding over the years. Later purchased by architect/designer team Lawrence and Sharon Tarantino in 1988, the new owners determined that preservation of the home would require a relocation. Crystal Bridges acquired the house in 2013. The house was disassembled, piece by piece, and transported 1,200 miles, arriving at the museum in the spring of 2014 where site work was already underway. Reconstruction began in the fall that same year, led by Scott Eccleston, Crystal Bridges’ director of operations, Ron Shelby, architect with Hight Jackson Associates, and Bill Faber with Bill Faber Construction. 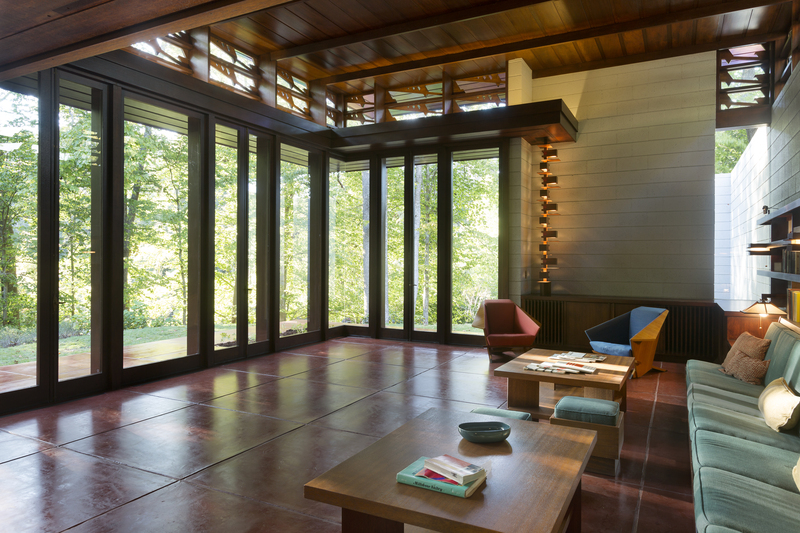 Exemplary of what Wright called Usonian style, an abbreviation of “United States of North America,” the Bachman-Wilson house encompasses some 1.700 square feet of living space in a so-called raised Usonian design, due to its upper level. Compared to Wright’s highly customized homes, these were simpler, lower-cost houses for the average middle-class American family, designed without sacrificing quality. Though every inch of space is well-utilized for efficiency and uncluttered living, especially in bedrooms, kitchen and bath areas, there is a notable expansion of space as one passes from compressed, narrow hallways or stairways into a comparably vast spaciousness in the main living area, and in the upper-level overviews. Wright embraced the word Usonian as a name for a distinctly American and democratic style of architecture. Having developed this style during the Great Depression, he built some 120 Usonian homes. For additional details about the Picturing the Americas International Symposium, special events, and the Bachman-Wilson house, please visit crystalbridges.org. The museum is closed on Tuesdays; Thanksgiving and Christmas. Crystal Bridges trails and grounds are open from sunrise to sunset daily. Museum admission is sponsored by Walmart and Sam’s Club.